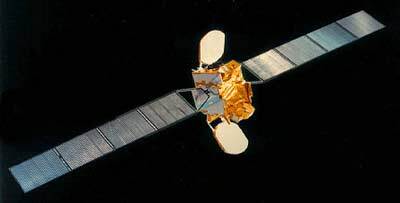 In 1990 Eutelsat began the deployment of the second generation Eutelsat spacecraft procured directly from Aerospatiale and based on the Spacebus-2000 design. Each Eutelsat 2 spacecraft supports 16 transponders (with eight spares) operating at 14/11 GHz and 50 W output power. In orbit the spacecraft spans 22.4 m across the two rectangular solar arrays which generate up to 3.5 kW. Eutelsat 2 employs two, 1.6 m diameter multifeed reflectors, one on each side of the spacecraft bus. Throughout 1993-1994, the Eutelsat 2 constellation consisted of four spacecraft: Eutelsat-2 F1 at 13 degrees E, Eutelsat-2 F2 at 10 degrees E, Eutelsat-2 F3 at 16 degrees E, and Eutelsat-2 F4 at 7 degrees E. Eutelsat-2 F5 was scheduled to join the network in 1994 but was lost in an Ariane-44LP H10+ launch failure on 24 January 1994. The last of the series, the Eutelsat-2 F6 spacecraft was modified scheduled for launch in 1995 under the name Hot Bird 1. The vehicle will be essentially the same as its predecessors, but the transponder output power will be increased from 50 W to 70 W.